I am currently occupying one of these elegant wooden tables in the Apple Store here at Leidseplein, Amsterdam. I've been here for half an hour now, taking advantage of their free WiFi while waiting for my 9:30PM depature to London tonight. That's my unfinished blog entry five days ago, and because I've been enjoying the comfort of this humble dwelling (my 'home' in the UK) since Saturday, I am afraid that I cannot continue and finish that post anymore. I have already forgotten how exhausted I was that time because what's left in my memories are the beautiful sights, magnificent man-made attractions, world-class transport facilities, friendly locals, invaluable artworks, and the indescribable feeling of being dumped in another planet! That funny feeling started the moment I stepped off the bus in Paris from London (where I wrote my preceding entry). I was expecting a covered and well-heated coach station after nine hours of travel so I was surprised upon getting off and seeing the ankle-deep snow at Porte Maillot Coach park! Too bad, I didn't get it the first time I read my booking notice- it was a 'park', NOT a coach station! Totally disoriented, I had the feeling that that place was in the middle of Paris, poorly lit, deserted (we arrived at 7AM but it was still dark) with two busy road tunnels nearby, without any toilet and there's a relatively huge shopping mall across the street- with a name I couldn't even utter (Le Palais des Congrès)! Luckily this building was already open so I tried to enter and was absolutely relieved to feel the warmth after being exposed to a lower-than-zero 'C for a considerable period while being left alone and completely lost in that cold and foggy Parisian street. 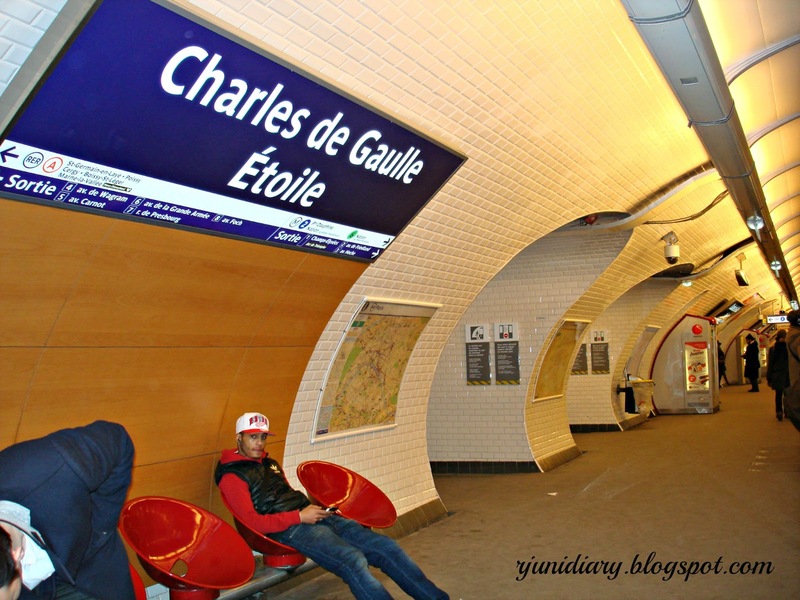 One of the stations of Paris Métro that I love to pronounce. After a few attempts, I successfully got an information from one of the cleaners of the mall (who, though broken, could at least speak the language I used), so with the aid of the 'arrows' on a series of signage written in French (that, again, I couldn't even pronounce and understand, I found my way to the underground train station. 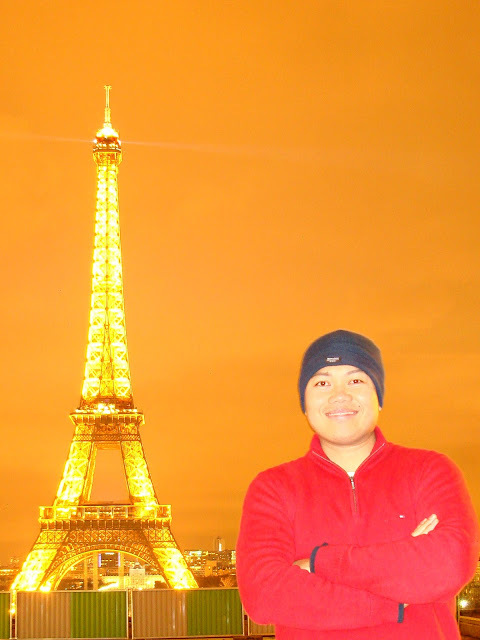 I spoke to the lady behind the information booth and told her that I wanted to see the Eiffel Tower as the day breaks. She recommended and offered a two-day travel pass (for any public transport across Paris; since I'll be staying in Paris for that period, anyway), directed me to the underground train line after giving me a small piece of folded glossy paper- where the colour-represented train lines were mapped. There was an encircled word on that brochure- a Paris Métro station, my destination so I could see France's most famous landmark. Then I realised that I should have studied French before deciding to venture in Paris! Everything was in French! The language spoken, the name of the train stations, the streets, shops, cafes, the labels of the foods and drinks, etc. (even the description of the artworks in the Louvre Museum)! 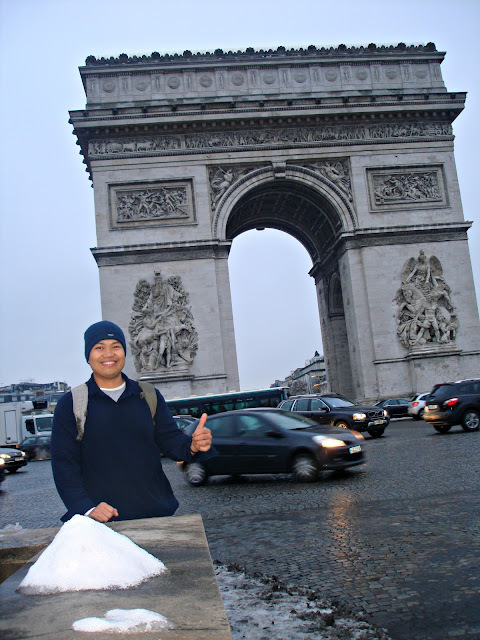 The Arc de Triomphe, Paris, France. To cut this story short, the direction given by that lady in the 'information' booth was wrong- just imagine a sleepy, totally disoriented tourist who's so excited to see the Eiffel Tower... going out of the underground train tunnel and saw the century-old arch in front of him, NOT a tower! Well, it was a historic landmark of France, so I took my camera out of my pocket, set it on auto-capture mode, positioned myself with my 'thumbs-up' signature pose and smiled as if I was not disappointed. I explored Arc de Triomphe, of course, and the rest of my stay in Paris was an interesting history! 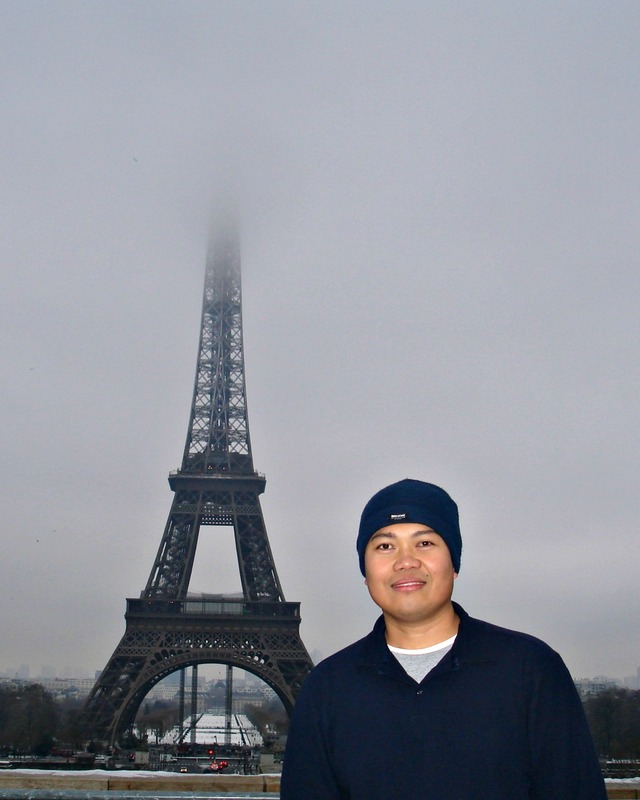 The Eiffel Tower hiding behind the clouds (fog?) This photo was taken from Trocadero area. NOTE: étranger is the French word for 'foreigner'. More than 1 liter of malt whiskey split between the two of you? Did you guys find your way home or if you were at home, did you wake up under the table? LOL. I once had one drink too many and I woke up in the wrong house with a hang-over and married!Just kidding. I was honestly surprised, (yes I got drunk that night but) I didn't get the bad headache the next day! Where are you heading next? I missed your travel posts.